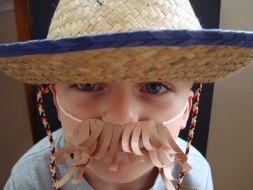 This Homemade Mustache is the cutest thing you'll ever see! This is a super fun and silly Cowboy craft for preschoolers on up, and it's great for dress up too! A preschooler can do most of this craft if an adult does the cutting for them ahead of time. 1. Print out the mustache template. You can either print it on your colored paper and cut out, or, you can print it out on white paper and trace it onto your colored paper. Cut some thin strips of paper to make the hair on your mustache. We cut our about ¼" wide. Then cut your strips into 1"-1½" lengths. 2. Measure out a piece of string or yarn that will fit around the child's head. Glue the center of the string onto the mustache. 3. Wrap each piece of paper, or "hair", around a pencil to make it curl slightly. The technical word for this is "quilling". Some preschoolers can do this step, but an adult may have to assist. 4. Start gluing your hair all over the flat mustache template. This can work better if you start gluing hair from the bottom up to the top of the mustache.